Fantastic products, beautiful design, efficient service! Couldn't be happier. Thank you for your kind help, Claire! Oh so pretty! The combination of these sweet vintage style flowers printed on these amazing wood is a beautiful result. 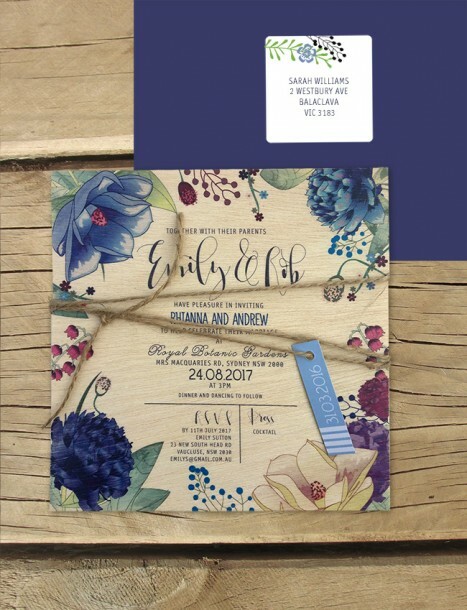 The wooden wedding invitations truly get so much attention from your guests - they are loved by everyone that see's them! They feel and smell so GOOD they really must be held in the hand to be appreciated as they are so much better in real life. It's a tactile experience and they have X factor ++ as far as wedding stationery! This sweet floral spray melts so well with the gentle grains of the wood, the tones blending beautifully. The carefully chosen artful fonts sit so well with this botanical arrangement, we love the lose, slightly free flowing style that is created. Perfect for so many wedding themes. Seen here on mohogany wood for a more muted, stunning vintage effect - or the lighter birch which really makes the colours pop! So pretty for a wedding these numbers are stunning. Order a sample to see for yourself! All designs come with a matching envelope - but we can change the colour if you had something else in mind - anything is possible just ask us. A lot of people also like them with a rustic kraft brown envelope. As with all our designs, they come with matching rsvp cards, wishing wells, placecards, menus and all other items. They just aren't up yet so please email us for pics :) We usually do matching items on paper in colour to get your costs down and they also look so gorgeous as a matching set. A very exciting part of choosing these invitations is that it's also a great choice for the environment. Not only are these little guys gorgeous and unique looking and feeling, they are a great eco-friendly option! Our lovely print guys tell us that printing on wood actually use less trees than printing on the same amount of paper and our printer actually plants a tree with every order. Thats a full tree, even though your invites will only use a tiny fraction of a tree to produce. The entire print process uses less energy, no water, much less waste and far less chemicals than the paper equivalent which makes the whole process better for the world. Yes we love them and their beautiful little sustainable set up! We are amazed at just how special these wedding invitations are in every way. So much to love. As you can imagine - these designs are so intriguing based on their printed material that you really have to see one first hand to appreciate them. Pictures will never properly explain their beauty and just how well this cute design works ion the wood. *Please note, the cherry wood is the darker and most grainy - so pretty, but given the nature of the material, being wood! The colour might vary slightly for your actual order from the sample you receive. It will still of course be cherry wood, but we can't guarantee the colour of each tree, they will be similar but some have a little more pink undertones and some a little more yellow - however they are all just divine. Part of the beauty of woking with a natural material. Also note that the wood comes in 2 thicknesses a thicker is available on request. 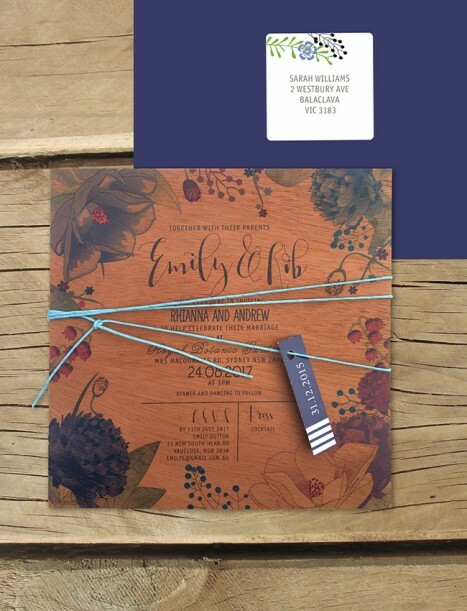 The wooden invites are such a unique and memorable option for your day, we hope you love them!